Leaders Portmore United suffered their second defeat in three games, while defending champions Arnett Gardens hit top form on Match Day 23 of the 2017-2018 Red Stripe Premier League (RSPL) on Sunday. Portmore United lost 3-0 away to Cavalier at the Stadium East field. Cavalier applied pressure to Portmore United from very early and scored two goals inside two minutes to open a 2-0 lead. Kaheem Parris opened the scoring in the 10th minute and Chevone Marsh doubled the advantage in the 12th minute. Alex Marshall sealed the victory in the 65th minute. Portmore United played most of the game with 10 players following the ejection of Michael Binns in the 19th minute. The defeat for Portmore United means that they have dropped six points from their last three matches after winning six straight games. It was the second straight away defeat for Portmore United, which suffered a surprised 2-1 defeat against Harbour View on January 14. With the victory, Cavalier (38 points) improved a spot to third, while Portmore United remain on 47 points, now a three-point lead as defending champion and second-place Arnett Gardens hit top gear to whip relegation-bound Sandals South Coast 5-0 at STETHS. Arnett Gardens, which have now won back-to-back games for six points after a long struggle during which they took just five points from six games, have improved their tally to 44 points. Fabian Reid led Arnett with a hat-trick, his goals coming in the 38th, 78th and 90th minutes. Javoni Simms (69th) and Kemal Malcolm (75th) completed the scoring. Over at the Edward Seaga Stadium, Tivoli Gardens slipped from fourth place to third after losing 2-1 at home to Reno. Andre Moulton handed Tivoli a 16th minute lead, but Linval Wilson (78th) and Afiba Chambers (81st) replied to give Reno all three points. 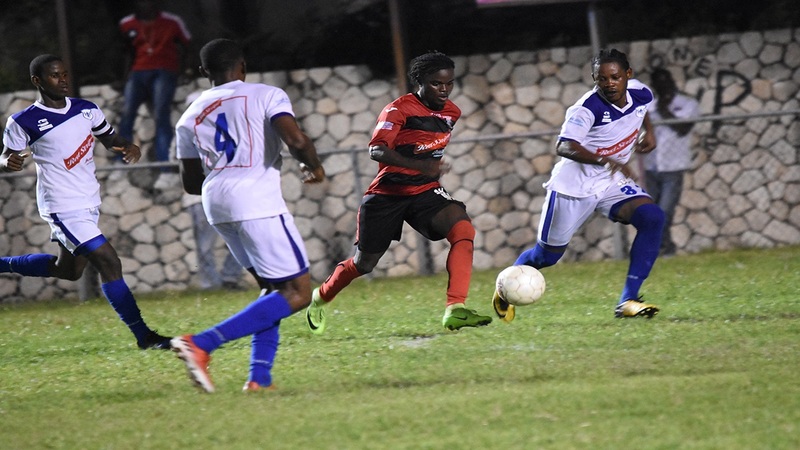 Reno jumped two spots to sixth place on 28 points the same as seventh place Waterhouse, which host University of the West Indies (UWI) FC in the Monday night fixture at the Drewsland Stadium at 8:35 pm.